Welcome to the Colonial Quarter, the popular local site that shows the history of St. Augustine through tours, shops, and dining experiences. Located on historic St. George Street, St. Augustine's Colonial Quarter holds several interesting stops, such as the 35-foot watchtower, several different colonial-era buildings, and numerous historic shopping and dining experiences. Your group can take the History Adventure Tour, which will take you up the watchtower, into a blacksmithing shop, and show you a live musket demonstration. 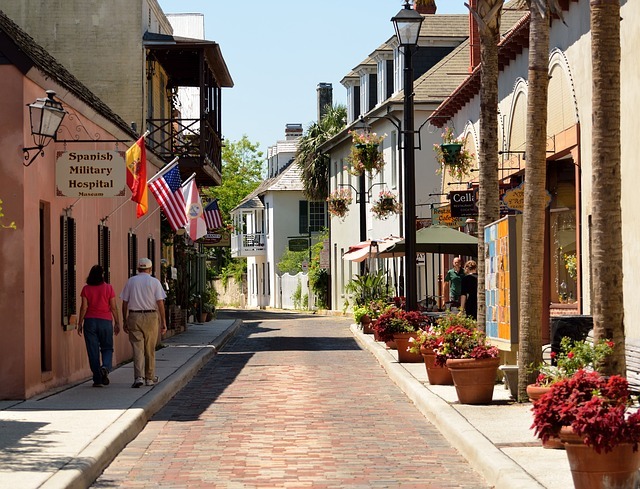 You will also stroll along the street section that holds the 'flags over St. Augustine' and see a 270-year-old home along the way. All of these things together will help you 'understand the success of the oldest permanent European settlement in North America'. When you work up an appetite stop at Saint Augustine Seafood Company, Bull and Crown, which was built on the original site of a Minorcan carpenter, or Tabema del Caballo, an 18th-century style tavern with highly popular tapas dishes. After you've filled your belly head to Explorer's Outpost and explore replica weaponry, maps, and provisions. Be sure to check if there are any festivals, concerts, or events happening here during your visit, Colonial Quarter being St. Augustine's largest and most attractive outdoor venue.